I watched Talk to Her tonight (technically, last night, as I write this). The original title is "Hable con ella". I went to Kendall Square's Landmark Theater, a theater featuring what some would consider "non-commercial" films (foreign, documentary, "art-house"). The director of this movie is Pedro Almodóvar, the acclaimed Spanish director, creator of "Tie Me Up, Tie Me Down", and "All About My Mother". 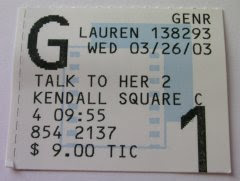 "Talk to Her" was the 2003 Academy Award Winner for Best Original Screenplay. The basic story: two women in a coma; two men who are their caretakers; friendships grow; love grows; in the silence of these women, there are stories, secrets. It's a beautiful movie. I cried (I'm glad I go alone; I make sure never to sit next to anyone). I laughed (despite the captions, you know when something's supposed to be funny). I saw bullfighting. I saw ballet. It moves at a patient pace. It's thoroughly original. This is the third movie I've seen in the theater this year.